There are currently 85,383 users on this website. I agree, AU and likely a details coin. Color doesn't look natural. 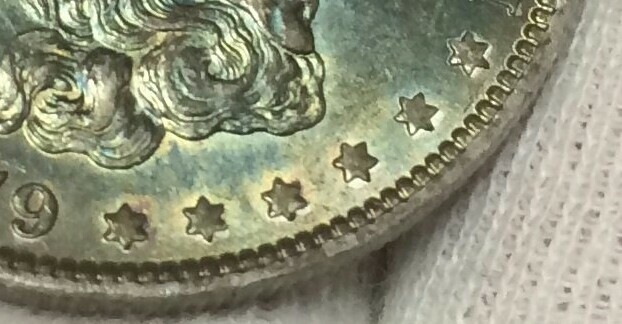 The dealer rated it coin AU+; no reference to toning. I bought it at a coin show and took what I thought was a good look at it before deciding. It looked like AU+ to me. I paid a premium over the Red Book price for AU50 because I liked the toning on the obverse. But when I got it home, the toning looked different to me; definitely not as attractive, and sort of artificial, as someone pointed out. Different lighting? Maybe. Also, I noticed some light spots on the top left hand side of the obverse that I hadn't seen previously. Based on all of the above, I have nicknamed this coin "Buyer's Remorse." Sorry for the delay in getting back to this thread. I wouldn't use the Red Book for prices...they are pretty inaccurate. My recommendation is to go off of Numismedia and eBay sold prices. Looks like questionable toning to me, I'd grade it AU-53 Details, artificial toning. My recommendation is to go off of Numismedia and eBay sold prices. Toning may be natural, if that is the pull-away effect that I'm seeing (hard to tell for sure, I'm having a hard time enlarging the images on my cellphone). It's not pull away toning in my opinion. Look at the forth right star as a good example. Authentic pull away toning is uniform to the feature regardless of the size of the pull, the op coin is very random in relationship to the features.